I like to listen to music when I’m making pizza. Loud music, usually cranked up as high as my computer’s external speakers will allow. Last night, it was Nirvana’s “Nevermind,” which recently celebrated 20 years in the collective listening consciousness. My 15-year-old son wandered into the kitchen while the last song (the hidden track), “Endless, Nameless,” filled the kitchen with sonic noise. “Nirvana,” I answered, although I always thought that track sounded more like my old band Active Driveway than the rest of Nevermind. “Yeah, that is good,” he admitted. Then we talked about how Kurt Cobain committed suicide. Then I told him that a friend of mine, Peter Boyle, also killed himself with a shotgun five years before Cobain. Peter was an artist, too, deeply troubled — tortured even — and, like Cobain, addicted to heroin. Peter shot himself in the barn at his family’s farm; he was 37 years old. 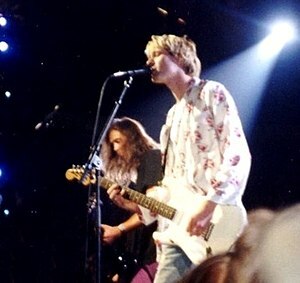 Cobain was 27. I won’t go into the significance of those ages, but you can read more here. Peter was an amazing artist who worked in a very unusual medium: sugar. In fact, he wrote the book on blown and pulled sugar sculpting techniques, which came out the year before he died. His work had just been featured in a show, ”The Confectioner’s Art,” at the old American Craft Museum (November 1988-January 1989) in New York. Peter tried to kill himself at least once before, that I knew about, while trying to quit heroin cold turkey. I intervened that time and suffered with him through a long night of his own personal Hell. I wrote a poem about Peter and his suicide a some time later called “The Cartographer’s Gambit.” I changed the subject from a sugar sculptor to a cartographer; I’m not sure why, but it seemed to work. whose charting is measured intensity. and hillsides of amber light. These are things he brought to life on paper, restless for rescue. He lumbers, cools with the injection. the cold spring chills him, he smokes a cigarette. with a scent of powder. Their opacity blinds him to reason. he dashes the coast with blue.